Tasted non blind. Opened and decanted one hour before serving. Tasted non blind on October 23, 2012. Served from 12 oz bottle. 5.5% ABV. Amber to gold color in the glass, clear looking throughout with a short yet fairly retentive head. Nose of malt, mild berries and light hops. 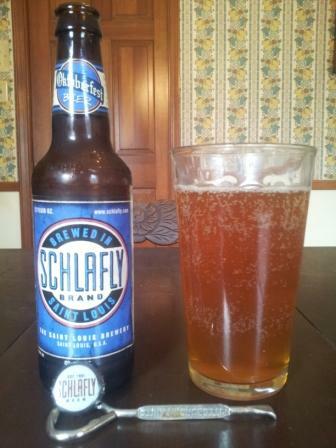 Flavors of malt, berries, a hint of sorghum and light hops on the finish. Clean and crisp with good weight on the palate. Good to very good. Let’s call this one three and a half stars out of five. 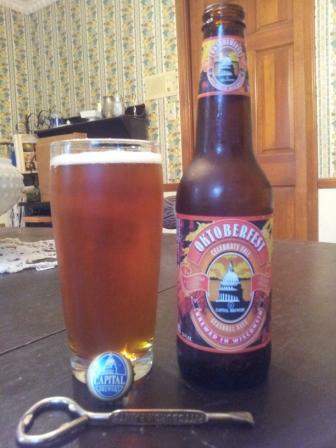 The mother of all seasonal beers has a firey amber hue with rich malty overtones that dominate the flavor. Tasted non blind on October 22, 2012. Served from Pint sized bottle. 5.5% ABV. Amber color in the glass, clear looking throughout with a short, somewhat quick head. Nose of malt, wet stones and a bit of spice. Flavors of malt, bread, a dash of sweet red cherry and a little hops on the finish. Pretty crisp on the palate with a clean finish. Good body, easy drinking beer. Good to very good. Let’s call this one three and a half stars out of five. 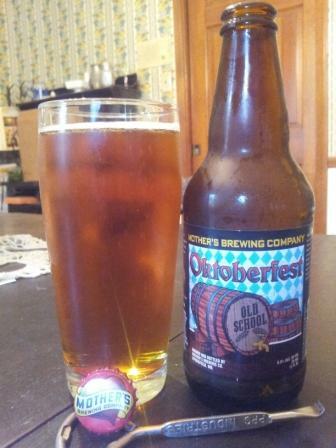 Old School Oktoberfest is a traditional amber lager brewed to celebrate the fall harvest. Extended aging creates a medium bodied beer with a smooth malty flavor and just the faintest touch of hops. Pull up your lederhosen, raise a stein, Ein Prosit! Tasted non blind on October 21, 2012. Served from 16oz Pint bottle. 6.0% ABV. Copper color in the glass, slightly opaque looking with a short, non retentive head. Nose of mahogany, caramel and malt. Flavors of spice, malt and nougat on the slightly clipped finish. Fairly clean, light and refreshing on the palate. Good. Let’s call this one three out of five stars. Tasted non blind on September 9, 2012. Tasted from 330ml bottle. 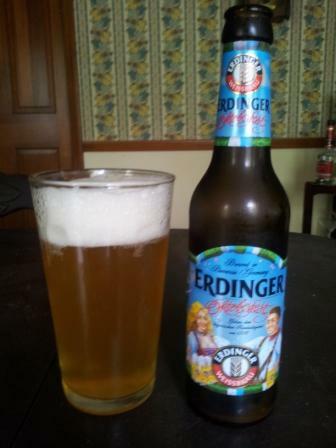 The Erdinger Oktoberfest Weissbier is yellow color in the glass, slightly cloudy looking with a good, pretty retentive head. Nose of flowers, yellow pears and wet stones. Flavors of yellow pears, citrus notes and a hint of breadiness on the short to medium finish. Pretty clean on the palate. Good to very good. Let’s call this one three and a half stars out of fives stars. Tasted non blind on September 9, 2012. Served from 330ml bottle. 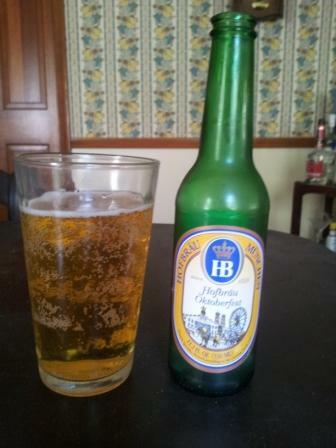 The Hofbrau Oktoberfest is a light gold color in the glass, clear looking throughout with virtually no head. The nose consists of aromas of heavy hops, malt and spices. Flavors of malts, spices and a hint of breadiness on the medium finish. Clean and refreshing on the palate. 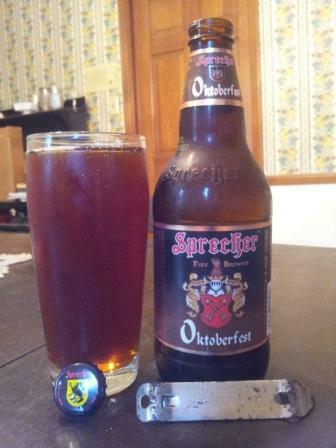 Comes across more like a pilsner or ale than a Marzen which most Oktoberfest beers come across as Marzen beers. Still, I like it for the cleaness and change of pace. I will also admit that I have a soft spot in my heart for Hofbrauhaus in Munich. Let’s call this one three and half stars out of five. I would go four stars but it just doesn’t have enough wow factor on both the nose and palate to warrant a full extra star.